Make your business more attractive by promoting yourself with ePromos' custom printed magnets! How many times a day do you pass by the refrigerator, open a file cabinet or grab a coffee from the break room? Well, you're not alone. That's why logo magnets are such a valuable promotional tool. Having your logo, message or contact information on fridges and cabinets in homes and offices is a stealthy marketing tactic with much success. It reminds people of your brand each and every day. With such a wide inventory and a variety of customization options, you can promote new initiatives, events or announcements in style. Start browsing our affordable promotional magnets now to really stick in the minds of new and potential customers. This handy custom bag clip / memo clip will keep your logo visible at home or at the office. Full color magnetic picture frame with detachable business card logo magnet and 16 motivational words magnets. Perfect for refrigerators of new homeowners, this house shaped promotional memo clip has magnetic back and spring loaded hinge. Full color promotional magnetic calendar with rounded corners. A full color custom magnet in the shape of a football that's perfect for team schedules or calendars! A full color promotional magnet with a handy calendar. This promotional magnet in the shape of a basketball will tell your fans you appreciate their support. These Transparent Custom Magnet Clips come in a variety of colors and stick to almost any metal surface. They are perfect for holding photos, memos, and calendars! With this custom business card magnet your logo will be visible on fridges and file cabinets all day and provides maximum exposure for your company or event. A promotional magnet, a picture frame, a calendar, & a great gift all in one! This promotional picture frame and logo magnet makes a great gift. The stop sign shape Full Color Specialty Shaped Logo Magnet is perfect for security companies, law enforcement and much more! One custom magnet, twice the logo exposure! Your logo will be visible on their fridges and cabinets all day with these imprinted business card magnets. 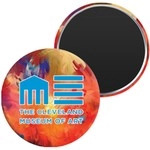 Raise awareness with this 5" round Full Color Custom Car Magnet! With proper use, these magnets can easily be removed and reused without damaging the vehicle. Printed magnets make ideal promotional tools for a variety of reasons. They're inexpensive in bulk, making widespread brand awareness more affordable on smaller budgets, they're practical and easy to use for anybody in any industry and they maintain your brand's visibility for extended periods of time. The next time you attend an event or trade show, be sure to pack some custom printed magnets to hand out to large crowds. Our variety of magnet products make promoting any business in any industry simple and quick. Promote a new line of snacks using magnetic chip clips for keeping food fresh. Inform your customers of your restaurant's new menu items by including a refrigerator menu magnet in delivery orders. Make a creative announcement for your wedding, baby shower, or graduation by creating custom save-the-dates on refrigerator magnets. Or help your clients stay organized with magnetic calendars. The possibilities are almost limitless with our assortment of helpful magnets. ePromos is here to help your business become a client magnet. Start browsing our inventory of promotional magnet products and give us a call for any assistance. Our experienced staff of graphic and branding specialists are on standby to field all of your questions.